Before you get started: it is always good to remember that any new cleaning solution should be tested in an inconspicuous area first to ensure it is safe for your type of flooring and to always blot gently and never rub. Also be careful not to use too much water. The first step is to take the spoon or dull edge of a butter knife and gently scrape any solid pieces from the carpet. Try to remove as much of the stain as possible. Apply cold water directly to the stained area. Put a small amount of dishwashing soap on a clean white cloth and blot or gently apply in a circular motion and then allow the soap to sit for a few minutes. After the stain has been allowed to sit blot again with cold water and the chocolate should lift from the carpet. Make sure to get all the soap rinsed from the carpet. Fill the spray bottle with water to saturate the candy and help to loosen its sticky grip on the carpet fibers.This could take a few minutes. Very gently scrape the candy free from the fibers with the dull edge of the knife or a spoon. Mix a solution of ¼ teaspoon of dish soap and 1 cup of warm water in a small container or bowl. Grab three paper towels and lay them on top of one another and fold into fourths (in half and in half again). Dip the folded towels in the soap mixture and saturate then ring out excess. Press the wet paper towels onto the sticky area of the carpet with constant firm pressure for about 20 to 30 seconds. Remove the towels and let sit for about 15 minutes. Get three more paper towels and fold as before, use them to absorb the liquid in the carpet after the 15 minute is over. With another three clean towels folded in fourths, apply a mixture of 1 cup white vinegar and two cups water to the area and press firmly for 20 seconds. Let the area stand for 20 minutes. 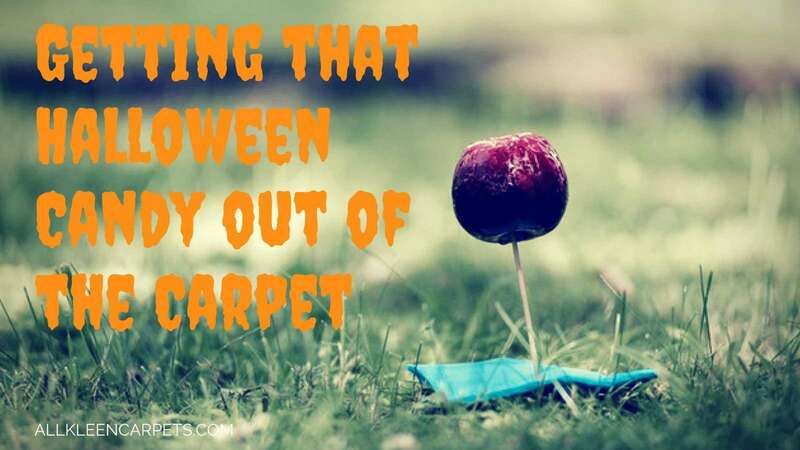 Finish with a dry paper towel or cloth to remove any moisture the carpet should now be candy and sticky free. Fill the zip top plastic bag with ice and place on top of the gum. Alternatively, you can use vinegar to soak into the gum for 15 minutes and then scrape the gum from the fibers. Use a clean cloth to blot any excess stain if the dye is already dry wet with a little cold water. If the stain is coming out just using water continue to blot with water and a clean area of cloth until the stain is gone. If the dye still remains use rubbing alcohol and warm water on a cloth and gently blot with a clean area of cloth. Once done with the alcohol if stain remains use hydrogen peroxide and let stand for an hour. Come back and rinse/blot with water until the stain is gone. For any stain that is still on your floor after attempting to spot treat you will want to call in the help of a professional carpet cleaner. For more tips and tricks please feel free to browse our blog and website. For expert carpet cleaning in the Snohomish County and North Seattle area make an appointment online with All Kleen today.